Working of capacitors often gets restricted due to losses such as leakage loses or surge shocks. While leakage loses can be reduced through proper insulation through an epoxy or ceramic coating, damage due to short circuits can be avoided only when the metal plates aren’t eroded due to high current. At surge voltages, while capacitors such as ceramic break down and lose their ability to store charge metalized film capacitors can repair themselves.Whenever high voltage is across the capacitor, instead of breaking down, the metal on the film gets perforated. The high voltage in turn also heats the dielectric film which expands and fills the part where perforation occurred. This increases the longevity of the capacitor, thus improving the working of the circuit. Based on the type of dielectric used, metal film capacitors are either of polypropylene or of polyester type. This article covers the polyester metallic film capacitor which is also known as Polythene –Teraphthalate (PET) capacitor. 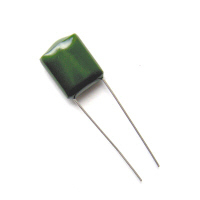 These capacitors are highly heat resistant and can work at temperatures close to 150 °C.